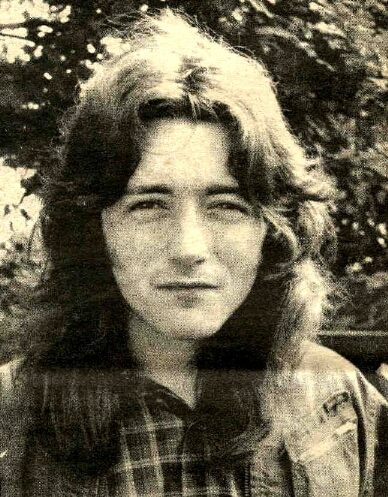 YOUR Rory Gallagher is a polite type of a fellow. He will stand up to greet your lady photographer, and he will stand up also to bid her farewell. He is well mannered, and will drink only that most gentle of drinks - the Guinness. Nor is he by any means your run-of-the-mill sort of pop star. He can sit in any pub in the country in his beloved old cords and Irish-and-Western checked shirt and not attract one iota of curiosity. Rory has earned himself the tag of a 'people's musician’ because of his tireless hard work and his uncompromising disdain of all things 'show biz'. But with typical modesty, he denies that he works exceptionally hard. "It's just that a lot of musicians don't work hard enough. They prefer to sit about in Claridge's, discussing images and enigmas. They prefer to complain. They're lazy. "As a kid, I had this image of a musician as a guy who works a lot, moves around getting to know different people and different places - and always developing and learning his music. "I've always thought that the best thing for a musician to do is to play. "I try to let my band travel and things work themselves out on the road. The problems only start when you get heavy managers telling you what to do." Rory expressed his surprise at how young his audiences are. After all, the day of the bluesy guitar-star is supposed to be long gone. "I'm delighted. The kids who come to my shows aren't just there because of what I look like. They're really quite knowledgeable about music. "But there's room for both kinds of music. Bowie's is the Greta Garbo approach. Whereas, I go more for the raw material. I like to get into people's bloodstream's. "When it comes down to it, you do what you do best. "I prefer 'bar poets', I believe in folk in ordinary clothing who rely upon themselves to entertain. Who can conjure up all the colours and images from inside themselves, without relying upon lighting and huge photographs and fireworks and all that. 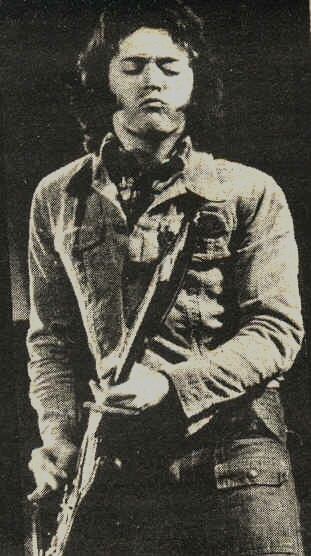 "If I wanted to be outraged, I'd rather listen to some of the double meanings in the old blues songs." Rory’s life style is what you might expect of somebody with his opinions and preferences. He lives with his brother, Donald - who is the sound-man for the group - in a flat in Earl's Court, West London. "I'm pretty well off, but I'm touring so much I don't have time to get into steady living. "When you're on the road, time flies so fast. I can still remember when I couldn't afford a new set of strings. So it still gives me a real lift when I see a guitar I like in a shop window and I realise I can walk in and buy it. "I own a car, but it's just for the group, I can't drive it." Rory steers well clear of the superstar clique. His spare time - what little there is - he spends in pursuing his own interests and hobbies. "If I have an evening off, I might look up some old friends - mostly people I knew at school or in Ireland and who are now living in London. Or I might paint or draw a bit. "If I'm free for a whole weekend, I'll go and visit my folks back in Cork. "I'm not into the fifteen- story mansion thing. I just do the gigs. I don't get involved in the socialising if I can help it." In the mad maelstrom of the pop world, it's refreshing to meet a man so normal, sane and unaffected. More power to his elbow.